The Act incorporating the town of St. Albans, Maine, was approved by the Governor of the Commonwealth of Massachusetts on June 14, 1813. 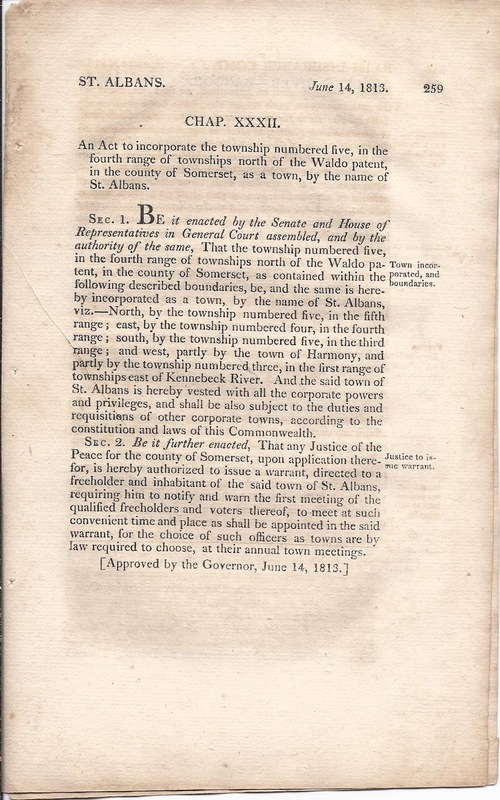 An Act to incorporate the township numbered five, in the fourth range of townships north of the Waldo patent, in the county of Somerset, as a town, by the name of St. Albans. Sec. 1. 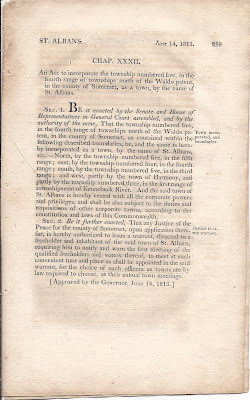 Be it enacted by the Senate and House of Representatives in General Court assembled, and by the authority of the same, That the township numbered five, in the fourth range of townships north of the Waldo patent, in the county of Somerset, as contained within the following described boundaries, be, and the same is hereby incorporated as a town, by the name of St. Albans, viz. - North, by the township numbered five, in the fifth range; east, by the township numbered four, in the fourth range; east, by the township numbered four, in the fourth range; and west, partly by the town of Harmony, and partly by the township numbered three, in the first range of townships east of the Kennebeck River. And the said town of St. Albans is hereby vested with all the corporate powers and privileges, and shall be also subject to the duties and requisitions of other corporate towns, according to the constitution and laws of this Commonwealth. Sec. 2. 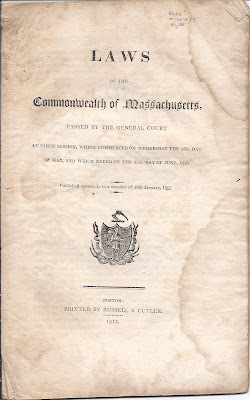 Be it further enacted, That any Justice of the Peace for the county of Somerset, upon application therefor, is hereby authorized to issue a warrant, directed to a freeholder and inhabitant of the said town of St. Albans, requiring him to notify and warn the first meeting of the qualified freeholders and voters thereof, to meet at such convenient time and place as shall be appointed in the said warrant, for the choice of such officers as towns are by law required to choose, at their annual town meetings. According to a source as of 2012, "The St. Albans Historical Society meets at 7:30 pm on the last Tuesday of the month at the Town Hall in the Historical Room."